There exists few hundred social networking sites and internet forums that require members to upload their photographs/avatars to display on their profile pages. Though most websites, including Digg, Youtube, Facebook, last.fm or Xing, accept images in JPG, GIF or PNG formats, they do not follow any standard dimensions or even the image aspect ratio (like 1:1 or 4:3). For instance, Digg requires a 48x48 pixel image, MySpace avatars are 100x100, Technorati prefers 64x64 square pictures while Orkut resizes your profile image to 120x90 pixels automatically. 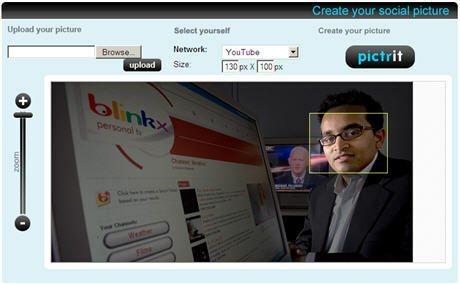 mypictr is a free online service that helps you convert your existing images into a perfect profile avatar. Upload your picture to mypictr, resize it and then download it to your computer. While you can do the same in any online photo editing software, mypictr is developed specifically for creating your profile pictures of the right width and height as required by the social networking site. A very useful feature of mypictr is that already has profile picture dimensions of most services like Skype, Flickr and even internet forums - that removes the need for any guess work and you can quickly create an icon for your profile.